Couples seeking romance on Valentine's Day—or any day—can seek a rendezvous at Kauai's Secret (Kauapea) Beach on the northeast shore. Though not the secret it once was, you do still have to find your way to this unsigned beauty, reachable via dirt road and trail down through a pandanus grove. The long beach is divided into three sections separated by lava reefs; surfer's put on a show mainly at the second and third beaches, and from all you can see the Kilauea Lighthouse on the bluff, which is part of a national wildlife refuge. 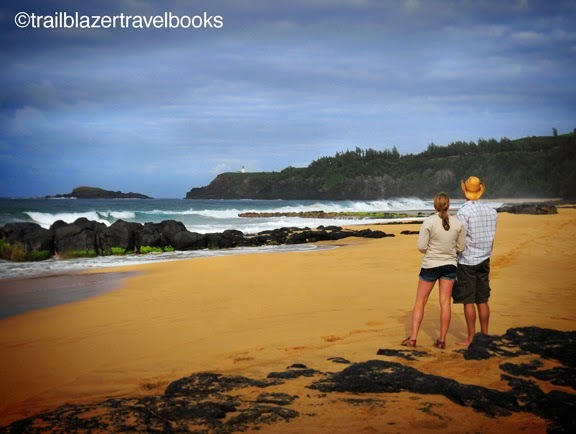 Kauai is definitely the choice for trails to wild beaches. A dozen or so ring the island, but most of them on the windward coast from Princeville south to Anahola. Wildlife will enhance a wild time: whales, monk seals, spinner doplphins, and seabirds, including the Laysan albatross (gooney birds). To cap off the day, head a few miles north to the fabulous Princeville St. Regis Hotel where you can pull a cork at sunset on their sky high cocktail deck and take in the glamorous view of Hanalei Bay. See the new Kauai Trailblazer for the deets.